With summer at its peak, it is only natural that the desire to do outdoor activities is going to surge. If you find yourself wanderlust for sunny beaches, mountain trails, and forest meadows, rest assured that you are not alone. Now, with the need for both relaxation and adventure comes the need for equipment. Packing the essentials is part of the fun. For the beach, you will definitely need an umbrella and sunblock. For the forest, you will need to ensure a pair of good shoes and a sturdy backpack. For camping, on the other hand, you will have to brush up on your tent-setting skills. These are all different activities requiring various pieces of equipment—all sans one, a trusted cooler. A good cooler will let you enjoy your packed food and drinks in full freshness. However, finding one is not as simple as it might seem. You see, like everything else, coolers have also evolved to be quite complex in terms of their features and functionalities. For this very reason, we have chosen to take a close look at one of our favorite coolers—the YETI Hopper Flip Portable Cooler. Be sure to stay tuned as we share with you the reasons why this is something that is worth investing your money on! Before we plunge into the details, let us introduce you to the brand first. 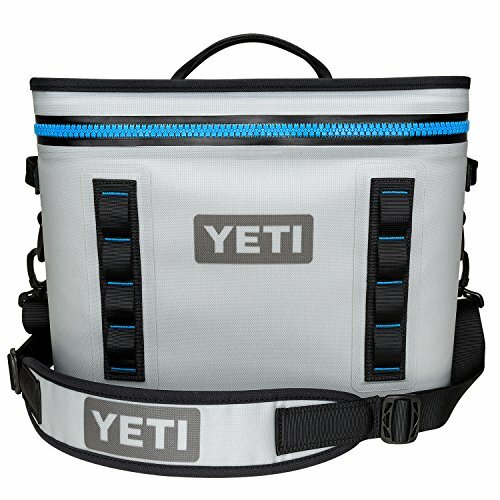 YETI products have an established and well-deserved reputation for being durable, high quality, and reliable. They are often purchased by people who have a taste for adventure and wanderlust, as well as by those who like to relax and simply enjoy good quality products. But then again, said quality comes at a price. YETI products are generally more expensive than the average for the market, which is, to a large extent, justified both by the brand’s sterling reputation and the quality materials used in manufacturing. The YETI Hopper Flip Portable Cooler is no exception. In our findings, we have discovered it to be a premium product, with a level of quality that speaks for itself. Take a look at its features and see for yourself. So, what about the basics? Well, this particular cooler is powered by ColdCell Insulation, which is, in essence, a closed-cell foam. This sets it apart from the average soft coolers that have limited capacity and lesser cooling time. What truly sets apart the Hopper Flip Portable Cooler from the rest, however, is the fact that it is 100% leakproof, all thanks to its HydroLok Zipper. This zipper system is responsible for closing a wide-mouth opening that makes accessibility and visibility of the contents as convenient as possible. It is not only the zipper that is waterproof, though. The Dry Hide Shell of the outer casing is not only waterproof and resistant to mildew but also protected against punctures and abrasions. It is built to last too. In fact, it does stand tall not only against time but also against strong winds, falls, and severe UV exposure. All in all, we can say that the merits of this product are pretty obvious in that there is little to fret about. Wherever you plan on going, you can definitely rely on its heavy-duty and UV-protected coating, as well as on its leakproof zipper system. With its advanced insulation technology, you can also be sure that your food and drinks stay cool for longer periods. For comparison, we have chosen the RTIC Soft Pack 30. It comes at similar dimensions (it is, however, one pound heavier) yet costs about half the price. It is made of laminated fabric and welded seams, which makes it lightweight and durable. With two inches of foam insulation, the RTIC Soft Pack manages to fit a whole 30 cans including ice, compared to just 18 cans that the YETI can hold. However, even though it also boasts a 100% leak-proof quality, it does not, in fact, have a leak-proof zipper. Similar to the YETI cooler, this product is also puncture-resistant and lined with antimicrobial material to resist mildew. Without question, YETI is the more popular brand and has an already established quality. However, one has to wonder how much of the price difference is due to the brand name. Nevertheless, it is clear that many people are satisfied with both products in terms of quality and durability, which is something that you should seriously consider before making a final decision. 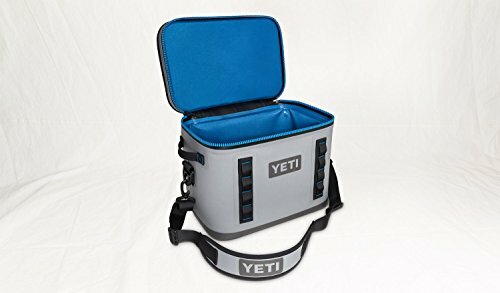 The YETI Hopper Flip Portable Cooler is obviously built for those who like to venture into more rugged kinds of environment. It is suitable for wanderers who are likely to simply grab their gear and go. It is a 100% leak-proof cooler that will keep ice solid for days at a time. It is made of materials such as those of HazMat suits and whitewater rafts, making it one of the toughest pieces of equipment you can find. Given that it seems purposed towards adventure, it is clear that it is not a product specifically designed for families. Thus, the limited capacity might be justified by the fact that it is not made to accommodate the needs of children but rather smaller groups or single travelers. With this in mind, we do recommend the YETI Hopper Flip Portable Cooler as a proven, solid piece of equipment for those who are likely to experience challenges in their adventures. For families and large groups of people that need something simple, with a big capacity, we would recommend other cheaper and more basic products. After all, to each their own, as they say!